Loaded with a lush assortment of seasonal berries and other fruit, there's nothing quite as lovely as a beautiful Fresh Fruit Tart. 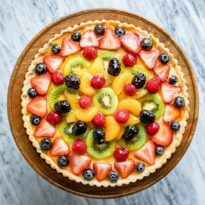 Learning how to make a fruit tart is one of the classic, basic recipes that leads the way into learning how to make other beautiful desserts. In a large bowl, whisk together egg yolks and sugar. Whisk in cornstarch and salt. In a standing mixer fit with the paddle attachment, or with an electric mixer by hand, cream the butter and sugar together on medium-high speed until pale and fluffy, about 3 minutes. Scrape down the sides of the bowl and add egg. Continue mixing until combined, scraping down the bowl as necessary. Add vanilla and salt, mix until combined. Reduce mixer speed to low. Add flour and baking powder and blend until the dough comes together (do not overmix). Scrape dough onto a piece of plastic wrap. Wrap tightly and chill at least 1 hour. Preheat oven to 350 degrees (177 degrees Celsius). On a lightly floured surface, roll out dough to a thickness of 1/8-inch to 1/4-inch (0.3 cm to 0.6 cm). If the dough crumbles or breaks apart, press back together with your fingertips. Loosely roll the dough around the rolling pin, then gently unroll it over the tart pan, preferably with a removable bottom (9 inches or 24.4 cm in diameter, or substitute a pie plate). Press the dough firmly into the bottom of the pan and up the sides. Trim any excess dough. Cover the dough with parchment paper or foil. Fill with pie weights or dried beans (you will need about 2 pounds or 1 kilogram, see notes). Bake 12 minutes. Remove pie weights or beans and parchment paper or foil. Return to oven and bake until golden brown and fully cooked, about 10 to 15 minutes longer. Cool completely. Fill cooled tart crust with chilled pastry cream. Arrange fruit in a decorative pattern. Using a pastry brush, brush fruit with melted apricot glaze (reheat as necessary if glaze cools and becomes too sticky). You can use dried beans when blind-baking the crust so the crust stays flat and does not puff too high. However, you cannot eat the beans after they’ve been baked. Just cool them and store them in a plastic bag for future baking projects. Or you can substitute pie weights, if you have them.